Mithraeum in Ro�anec – Mithraeum. Our Common Sun. N-W of Tschernmbl (Črnomelj) near Ro�anec there is an open space surrounded by rocks (H. 6.00-8.00) near the Church of St. George. This space, the so-called "Judovje" was used as a Mithraic sanctuary. The entrance to the cultroom (L. 36.00 Br. 13.00) is at the south of the site (Br. 10.00). 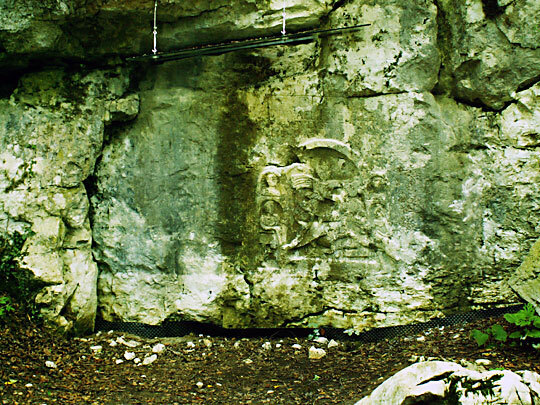 According to Hitzinger remnants of animal bones were found in front of the relief. In old photographs shown by Dr. J. Kastelic of Ljubljana a semi-circular basin was to be seen constructed in brickwork against the backwall before the relief. The relief is described in CIMRM 1482.